Textured fingerpads. Interwoven plastic and rubber grips add structure and style. Dual-layer casing. Patented design provides two layers of protection in a single-piece, pop-in construction. Gamers and butterfingers are in for a treat. 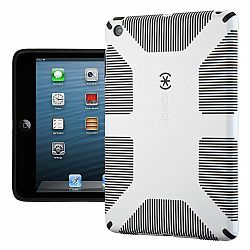 CandyShell Grip for iPad mini adds grippy ridges to a double-coated protective case, so you’ll always keep things at hand.